Team Canada remains the only unbeaten rink at the 2017 WWCC in Beijing after soundly beating the Swiss team 6 - 2 and handing them their first loss of the tournament. The ladies were in much better form today all scoring in the high 80's except for Joanne Courtney who has been consistently in the high 90's. There next match is against Korea later on tonight. Apparently the dense smog in Beijing has been playing havoc with many of the players and was causing problems inside the venue when filters failed to clean the incoming air. Officials seem to have a better handle on it now but all players are wearing masks as soon as they leave the building. In spite of being outplayed for most of the game by their opponents Team Korea who came into the game having lost 3 of their last five games, Team Canada again managed to pull off a win..........by a whisker. In what should have been a fairly easy game for our ladies, they found themselves in a pitched battle end after end, often the result of poorly placed draws or missed take-outs. Yet time and again they were able to comeback in each end and limit the score to 1 or 2 points at the most for the opposition, and for the fourth game in a row they had a perfect end and were able to put 4 on the board. Make the final 8 - 2 as Team Canada takes four in the 7th end to beat Team Scotland for their 7th win of the championship. Team Canada facing their toughest test yet in Team Sweden easily managed to outscore the Swedes and won an automatic trip to the 1 - 2 page play-off. Team Canada will play Team Italy later tonight. BEIJING — Team Canada has completed a perfect round robin at the 2017 CPT World Women's Curling Championship in Beijing. Rachel Homan's Ottawa team defeated Denmark's Lene Nielsen 8-4 at the Capital Gymnasium Thursday afternoon. With the win, Homan's squad became just the third ever to go undefeated in round robin play at the tournament, joining Sweden in 2005 and Canada in 2003. Anette Norberg's Swedes went on to win gold in Paisley, Scotland in 2005, while the Canadian squad led by Colleen Jones settled for silver in Winnipeg in 2003. The next assignment for this year's team is the 1-2 Page playoff game on Friday against either Sweden or Russia. The winner of that contest will go on to Sunday's gold medal-game, while the loser will drop into Saturday's semifinal. After finishing the round robin having beaten every single team in the round robin for only the 3rd time in WWCC history - the second time a Canadian team has done so, Team Canada will play for Gold on Sunday. It was a bit of a shaky start for Team Canada against Team Russia this morning in the 1 - 2 Page Play-off especially when Rachel missed on a draw and Russia scored a deuce, but the ladies came roaring back stealing the next 3 ends. In the 9th, Team Canada scored 1 to go up 7 - 3 and Team Russia conceded defeat. Team Canada will now have Saturday off and will wait to see which team they will meet in the Gold Medal round on Sunday. Made it to the A final. Got 3 hours of beer and tequila shots before the final. Let's separate the men from the boys. The men drink responsibly. The boys don't. Team Canada are the 2017 World Women's Curling Champions!!! Absolutely outstanding championship for our ladies. Well done Rachel, Emma, Lisa and Jo. Thank you all for representing our country with skill, class and determination. It was an historic victory not just for ending the longest gold-medal drought for Canadian women’s teams (eight years); Homan’s team became the first in the 39-year history of the women’s worlds to run the table, going a perfect 13-0 en route to the gold medal. Now that our Canadian ladies have shown themselves to be top of the order, our Canadian men will have their chance to prove their worth once the Ford World Men's Curling Championship gets underway this coming Saturday, April 1rst. This year the WMCC will be held in Edmonton AB which will make watching the draws a lot easier as I won't have to get up at 3:30 in the morning to catch them. The first draw features Team Canada aka Team Gushue vs Team Switzerland and will get underway at 1PM PST on TSN 1, 3, 4, and 5. Best of luck to Team Canada as they try to match the success of our outstanding ladies team. So far, so very good for our men's Team Canada at the World's in Edmonton. In addition to winning their first 3 games and looking to make it 4 in this current game against Scotland, Canada has the #1 skip in Brad Gushue and the #1 second in Mark Nicols. The Canadians have played the top teams at the tournie so far and once they get by the USA and China all the teams they will face are having very poor draws so far. We'll see how it goes but I do have to say that Gushue and the guys are doing a bang up job so far of representing our country. Canada currently leads Scotland 7 - 2 with 2 rocks left to play in the 7th and holding the hammer. Davie comes through with a couple of good throws forcing Brad to a single and a 8 - 2 lead...............and the hands come out for a shake and good game, good luck and Canada has won it's 4 in a row. Looking good guys. In spite of the fact that the guys were not quite on top of their game this evening, they still managed to walk away in the 8th end after going up 8 - 2 over John Shuster of the US. The US also had its struggles but did manage to steal one end from Canada though they followed that by giving up 3 in the next end and Canada never looked back. The guys struggled in the first few ends with both draw weight and broom position but they improved as the ends went on and were very sharp in the 6, 7 and the 8th when the US conceded defeat. Make that 5 in a row for Canada still alone at the top. Make it 7 in a row for Team Canada and another chance to get off the ice early as our guys scored a deuce in the 8th to go up 9 - 7 on China who then conceded the game. Team Canada can breathe a bit easier now as they have played all the teams that might have given them some trouble and can look forward to playing ones who are struggling to even win a draw. Good solid win Team Canada. Keep rockin' the ice guys. GO CANADA, GO! I really feel for Team Germany right now, Canada hasn't missed a single shot in four ends and lead 7 - 1 going into the 5th. Not only is the German team struggling to make shots and read the ice but when they do manage a good throw, our guys immediately remove the rock or land a better shot. Here in the 5th with two rocks left and the hammer, Germany hasn't a single rock in the house and Canada sits 3. If Germany is really lucky they may be forced to take 1, if not they might be able to blank the end - worse case scenario is Canada stealing it. Good for Germany, they were able to put a point on the board and are now only 5 points down midway through the draw. Germany conceded after only 6 ends and the Canadians walk away early with an easy 8 - 2 victory. After defeating the Netherlands 8 to 3 in the first draw this morning, Team Canada is currently leading Japan 7 - 1 in the 5th after scoring 5 in the 4th. Should Canada go on to win this draw they will secure their berth in the 1 - 2 Page Play-off. They will play their final matches tomorrow against Norway in the morning and Italy in the afternoon. Last edited by Mowich; Apr 5th, 2017 at 04:43 PM..
Brad and the boys put a lock on first seed in the Men's Worlds today as they put away Italy 9 - 2. Brad got himself another 5 point end, his second of the championship. Team Average was 93% overall with Brad 100% on his draws and Mark Nicols 98% on his. Team Canada has outscored their opponents 53 - 15 so far and haven't played a full 10 ends in the last five draws. Great curling by our guys. Team Canada plays its last draw later today against Norway. I have no doubt they will once again be going home early. Way to go Team Canada. Well done lads. They didn't get off the ice quite as early tonight but after 8 ends, Norway conceded and Team Canada finished the round robin with a perfect 11 and 0. Stay the course Team Canada - it has served you well. Congrats on matching the ladies - 2 more perfect draws and you will have accomplished a remarkable feat for your country. Canada is now home to the Men's Olympic Curling Champions, the Women's Olympic Curling Champions, the Women's World Curling Champions and the Men's World Curling Champions, the Junior World Men's and Women's Curling Champions and the Seniors Doubles World Curling Champions. Not bad for our little old country........not bad at all. As Davie Murdoch once opined, curling was born in Scotland but it grew up in Canada. Congratulations to all our curlers for an outstanding season of champions. Thank you one and all. It was a tough match tonight. To cap off what has been nothing but a stellar season, Rachel Homan and her ladies (minus Jo) will be taking home the Pinty's Championship Cup and a nice check for $40,000 today. It came down to a very finessed final shot in the 8th end - a chip shot off the opposing team's rock to tip her own into the ring. Rachel never missed a beat. It was not an easy game for Team Homan nor for their opposition - Team Hasselborg of Sweden. Though both teams struggled at times to find the right line and weight, they also managed to make some OMG shots too. Team Hasselborg may be a young team but they have all the necessary skills and talent to play in the big leagues, as was seen this past week when they defeated all but one of the 13 teams who came to play. Meanwhile Joanne Courtney (of Team Homan) was at the World Mixed Doubles Championship. She, along with her freshly minted partner Reid Carruthers, after a bit of a shaky start managed to steadily improve over the week. Considering that the Canadians had never played as team before and they were competing against teams that had, taking home a Silver and a berth in the Olympics was a win-win situation as Canada had never done better than a Bronze prior to this year. The Women's Senior Curling Championship held in Fredericton, NB concluded a couple of days ago and Team Saskatchewan skipped by Sherry Anderson took home the cup and a berth in the Senior Olympics. Later on today, Team Jacobs will play Team Koe in the Men's final at the Pinty's Championship. There were some outstanding shots made by the fellows this week. End after end saw take-outs with a one in a hundred chance, draws that slid easily to the exact spot called and guards that ate up rocks trying to be removed. Brad was curling 100% on his draws yesterday and Kevin was in the high 90's on his - both of their hits were in the high 90's. I'm looking forward to a great final. I do love seeing a woman do housework. This is the 12th time a Canadian Junior Women's curling team has won Gold for Canada. Well done ladies. Enjoy your victory, I am proud of you all. Apparently, from what I heard while watching the Brier, our Junior Men's team will also be bringing home Gold for Canada but I can't find a link to a news item about it yet. Team McEwen was perfect through every draw of the Princess Auto Elite 10 of Curling and in the final soundly routed Team Canada aka Team Gushue. So happy to see Mike and the boys win this one in their own province of Manitoba. Well done Mike. 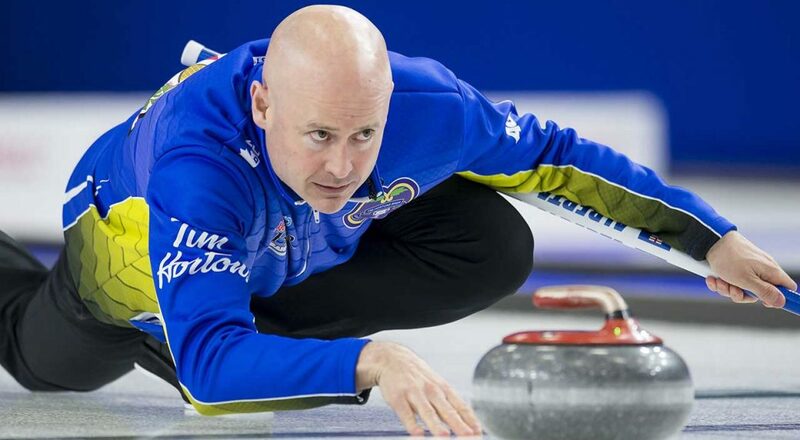 Kevin Koe won the Canadian Championship with a helluva pressure final shot. Nice to see him represent Canada at the Worlds. Helluva a final, Kreskin. Koe's numbers/stats weren't great throughout the tournie but somehow, someway he kept managing those big shots exactly when they were needed. Way to go Team Alberta - now Team Canada. Very happy for all of them. He can be clutch. The way he somehow 2 out of the last end was marvelous. It wasn't setting up well, but his two rocks were something else. As always, I really enjoyed the Briar. I especially enjoyed seeing the young team that now represents ON - those young guns have some great shots and strategies up their sleeves. There was some great shot making by every team that played. I also enjoyed watching Team N ON go through the preliminary rounds flawless - too bad they wound down in the play-offs. Both Jacobs and Koe drive me crazy with their lack of good time management - making those clutch shots with seconds on the clock is hard on my old heart. Women's Worlds next up on TSN Curling. Not a fan of Carey's but they are representing our country, so I hope they do well. "Hurry hard" is not what you think. Ha ha, before Koe threw his final rock I heard one of his team members say, "no rush, you've still got 30 seconds". Ya, no need to feel like anything is URGENT. It was unreal how Carey's team stole 4 ends to win the Scotties final. I'm not a big fan of her either, but neither am I fan of Holman. Every time I look at her I think of Tom Petty, and it drives me crazy. Oh dear............I am a fan of both of them, Kreskin. When I am house-cleaning I like to put Tom on and play 'You belong among the wildflowers' - gets the job done in no time. That said, you are right about the Scotties final - Carey did a great job. Backyard curling, why not? Make your own curling stones!